How do troops feel about President Trump? We asked our active duty readers about everything from Space Force to their support of the president and whether we should keep sending forces to Iraq - and here's what they said. WASHINGTON — President Donald Trump’s approval rating among active-duty military personnel has slipped over the last two years, leaving today’s troops evenly split over whether they’re happy with the commander in chief’s job performance, according to the results of a new Military Times poll of active-duty service members. About 44 percent of troops had a favorable view of Trump’s presidency, the poll showed, compared to 43 percent who disapproved. The results from the survey, conducted over the course of September and October, suggest a gradual decline in troops’ support of Trump since he was elected in fall 2016, when a similar Military Times poll showed that 46 percent of troops approved of Trump compared to 37 percent who disapproved. That nine-point margin of support now appears gone. During that same period, the number of neutral respondents has dwindled from almost 17 percent to about 13 percent, suggesting political polarization inside the military community has intensified in recent years. Still, the latest survey shows that military service members are more supportive of the president than the American public at large, which, according to the most recent Gallup poll, approves of Trump at a rate of 43 percent compared to the 53 percent who disapprove. “The general rule of thumb with the military is that it moves along with public opinion but lags conservative,” said Peter Feaver, a former adviser to former President George W. Bush who is now a political science professor at Duke University and an author of several books on military culture. he new survey results also show sharp divides within the ranks. Enlisted men show Trump the most overwhelming support. Military women, meanwhile, have a much harsher view of Trump’s time in office. Officers still have a lower opinion of his presidency than enlisted troops. The poll, which includes responses from nearly 900 active-duty troops in recent weeks, comes just a few weeks before the November midterm elections, where the balance of power in Congress could shift, potentially redefining Trump’s presidency. It also comes after months of controversy surrounding the Supreme Court confirmation of Brett Kavanaugh, Russian interference in the 2016 election and instability in Trump’s administration. The military hasn’t been immune from such controversy, being drawn into national debates over transgender troops and border security priorities. Troops surveyed continue to give high marks to the president for his handling of military issues specifically. More than 60 percent said they believe the military is in better shape now than it was under President Barack Obama, and nearly the same number have a favorable view of his handling of the military. Last month, Congress finalized a $674 billion defense appropriations measure for fiscal 2019 which included another end strength boost, a host of new equipment purchases and the largest military pay raise in a decade. “Trump has done some things to win the hearts of the military, whether it has been the budget or just avoiding a foreign policy catastrophe,” Feaver said. “And he has talked about the importance of the military, making it a focus of his campaign and presidency." Is Trump signaling to 'Mad Dog' that he's open to change in the top DoD post? The uptick in defense spending was cited by several survey respondents who were interviewed by Military Times. “[Trump’s] definitely improving the readiness of the military and giving us the resources we need to get the mission done, not hamstringing us by cutting our budget," said Staff Sgt. Kyle Overholser, a 31-year-old airman stationed in Arizona. The increased defense spending will likely deter major adversaries to some extent, Overholser said in a telephone interview. Yet other service members voiced concerns about Trump’s temperament and suggested that was eroding his support among troops. “After he got elected, most of the people in the military wanted to give him [Trump] a chance,” said Jordan True, a 25-year-old petty officer first class in the Navy. “But to me, it seems like his presidency is a popularity contest for his ego. I think he rushes through decisions a lot based on emotion or helping his friends out. I’m just thankful I’m getting out of the military because him [Trump] rushing decisions could lead us into an unnecessary war." Only 13 percent believe that Obama’s military was in better shape than Trump’s, according to the poll. The current president also receives continued high marks for his choice of defense secretary, former Marine Corps Gen. Jim Mattis. Similar to past polls, Mattis has a favorable rating among troops of nearly 84 percent. Support among officers increased in the last year, with more than 89 percent voicing a favorable opinion. Reflecting views in the broader American public, Trump’s support is higher in the military among men and enlisted troops, and significantly lower among women, minorities and officers. A CNN poll released earlier this month put Trump’s disapproval rating among women at 62 percent. In the Military Times poll, that figure topped 68 percent, with only about 26 percent of military women expressing a favorable view of the president. The poll was conducted before the Kavanaugh Supreme Court confirmation vote by the senate, but responses were collected while much of that process’ focus was on sexual assault allegations leveled against the nominee. Among military men, Trump still enjoys a 47 percent favorable rating and a 38 percent disapproval mark. Dissatisfaction with Trump among minorities in the ranks was less pronounced than the gender gap, but still significant. 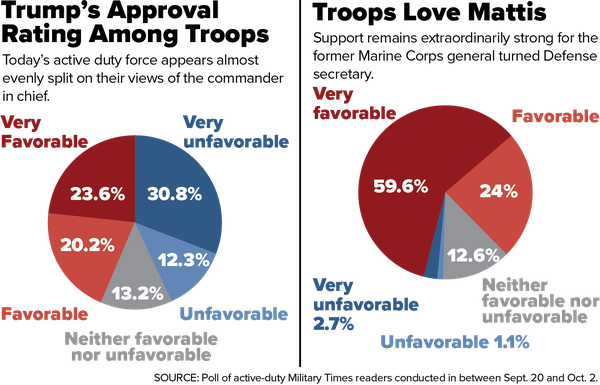 Only 29 percent have a favorable view of Trump, as opposed to 47 percent with an unfavorable view. Since the December 2016 poll, the biggest shift among minorities has been into the “no opinion” viewpoint of his presidency. Two years ago, only about 15 percent of that group did not have a positive or negative view of Trump. In this poll, that figure rose to nearly 25 percent, drawing from both the favorable and unfavorable camps. As has been the case in the past, the poll shows that officers are less enamored with Trump than enlisted troops. More than half have an unfavorable view of his presidency, against 41 percent who have a favorable view. Still, that’s an improvement for Trump, who saw only a 31 percent favorable rating from officers in the poll one year ago. Enlisted service members trend in the opposite direction. 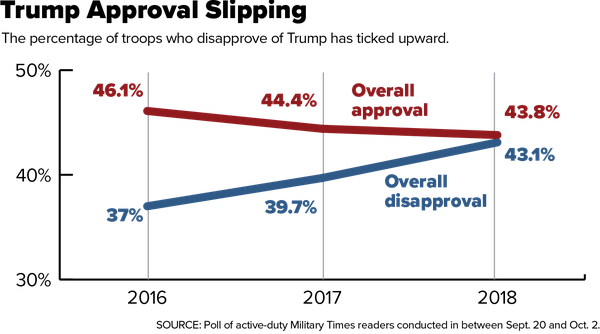 More have a positive opinion of the president (about 45 percent) than a negative view (about 41 percent), but those numbers are down from a 49 percent favorable, 34 percent unfavorable split two years ago. In most categories, troops were more likely to fall into the “very favorable” or “very unfavorable” groups when asked about Trump’s presidency, suggesting the military may be even more polarized than the overall differences suggest. The Marine Corps voiced the strongest support for Trump among the four services. One Marine captain stationed at Parris Island said he was happy with Trump and his handling of the economy and his tougher stance against other countries on trade. The captain, who asked to remain anonymous, said he liked the fact Trump is not a career politician. “If he could tamp down on the Twitter a bit, that would be ideal,” the captain said. Between Sept. 20 and Oct. 2, Military Times in collaboration with the Institute for Veterans and Military Families (IVMF) at Syracuse University conducted a voluntary, confidential online survey of U.S. service members. The survey included 19 questions on service members’ opinion(s) related to the current political climate, policy and national security in the United States. The survey received 829 responses from active-duty troops. The IVMF used standard methodology to estimate the weights for each individual observation of the survey sample. The margin of error for most questions was roughly 2 percent. The survey audience was 89 percent male and 11 percent female, and had an average age of about 31 years old. The respondents identified themselves as 76 percent white, 13 percent Hispanic, 9 percent African American, 5 percent Asian and 6 percent other ethnicities. Respondents were able to select more than one race. Staff writer Kyle Rempfer and Geoff Ziezulewicz contributed to this story.